By following instructions to make corsages, you can easily make one of these beautiful arrangements yourself. Corsages are small floral arrangements typically worn on the wrist or pinned to the chest. Corsages are a popular gift for men and women for special occasions such as weddings, proms, or balls. You can make a simple corsage using one or two flowers, some foliage, and a few small tools. Homemade corsages are often cheaper then corsages bought from florists, and they allow you to tailor the corsage to the recipient. In order to make a corsage you will need flowers and leaves or any other foliage you wish to use. You can get flowers from your yard, a florist, or purchase artificial ones. 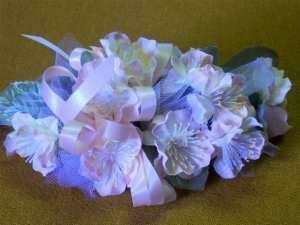 You will also need a few supplies and tools to tie the corsage together. They can be purchased at a craft or hobby store, or from a local florist. Choosing the flower you wish to use on your corsage can be the most difficult part. Since the flower is the focal point of the floral arrangement, you want to choose a flower that matches the personality or dress of the person who will be wearing it. If you are making a corsage for a couple, you may want to choose one type of flower for both corsages so they match. You can use either real or artificial flowers. If you choose artificial flowers, they will last much longer and you can use a more delicate flower. If you choose a real flower, be careful to choose one that is not too delicate and will hold together while being worn. You can use the leaves and stem from the flower you choose to add foliage to your corsage. You may also want to add filler pieces like Baby's Breath around the flower to add to the design. Instructions to make a corsage are easy to follow and can be completed in a few hours. Start by separating your flower, any filler pieces you want to add, and each individual leaf. Add a wire to every piece. You can add a wire to flowers and filler pieces by pushing the wire through the middle of the stems. You can add a wire to leaves by pushing the wire through the thick green part on the back of the leaf, then wrapping the wire around the stem. Once the wires are in place, wrap the stems of the flowers and leaves with the floral tape to make them stronger. Place the flowers, filler, and leaves in to a design and use the floral tape to hold the pieces together by wrapping the tape around the bottom. Cut off any wire that extends past the corsage. Insert two large corsage pins in to the corsage. You can add ribbon throughout the piece to enhance the design if you choose. Following instructions to make corsages will allow anyone to become a florist at home. However, remembering a few tips will make the process much easier. Decide on the arrangement you want before adding the wire and floral tape. Use a floral tape that matches the colors of your stems to blend the design. If you make a corsage from real flowers, you can extend its shelf life by storing it in an airtight container in the refrigerator. Do not choose a flower that is too delicate, as it may fall apart while it is being worn. Be careful to insert the corsage pins through the thickest part of the stems. This will help the corsage hold up better, and prevent the flower from being damaged.